In a one-two for Israel, Uri Gilboa, a 61-year-old lawyer and keen bridge and poker player, beat fellow countryman Zakhar Babaev heads up to claim the European Poker Tour (EPT) Sochi 2019 trophy and 27,475,000 (€382,000) first prize. In one stroke he became the first Israeli and the oldest player ever to capture an EPT title. A total prize pool of 145,500,000 rubles (more than €2 million) was awarded to the top 111 finishers from a field of 758 representing 47 countries. Zakhar Babaev, starting the final day with double the stack of his closest opponent, went from strength to strength at the start of the final table, whether bluffing with seven-deuce off-suit or busting Serafim Kovalevsky in 6th (5,390,000?) with a higher pocket pair (eights vs. sixes). Babaev’s only stumbles seemed to come when playing against fellow countryman Gilboa, who, after winning several big pots, managed to catch up in chips and then edge into the chip lead in Level 29. A dramatic hand that sent the PokerStars Twitch channel’s chat crazy - involving a backfiring ace-high turn shove from Vyacheslav Mizun – saw the beginning of the end for the 30-year-old. Mizun, having played poker for only a year, had a high-adrenaline final table experience with his stack on the line multiple times before he was finally eliminated in 5th (7,091,000?/€98,000), picking up a hefty prize for his first major live win. Four-handed, Ivan Ruban’s stack seemed stuck in the last place, hovering around 1 million chips while the two chip leaders juggled 15 million between them. The 26-year-old from Moscow, who has been playing poker for six years and already has an Estrellas Barcelona Main Event cash under his belt, took his last stand all in preflop with the often-seen matchup of queens vs. ace-king. This time, Babaev hit an ace, and Ruban picked up 8,953,000? (€124,000). The last Russian player in the Sochi EPT Main Event, Maksim Pisarenko, held on with a dwindling stack for a long time, but his patience was not rewarded by the deck, and he had to settle for third place and 11,865,000? (€165,000). A crucial point in the following heads up battle between Babaev and Gilboa came when the latter had gained a nearly 4:1 chip lead and took a shot at busting his opponent with a flush draw when Babaev had flopped top pair. The flush did not come in, and it took another half a level for Gilboa to finally beat his opponent – although Babaev did win a sizeable 16,737,000? (approximately €232,000) for his runner-up finish. 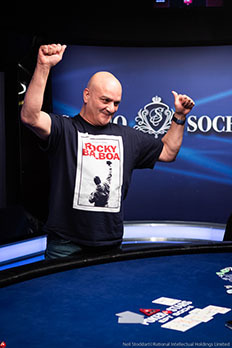 Gilboa, a father of four, had been eagerly watched live as he fought his way through the Main Event by his regular group of Thursday night poker buddies, who advised him that his ‘ROCKY BALBOA’ T-shirt should be worn throughout after it saw him safely through Day 1. When he won the tournament, his first question was, “Where is Moneymaker?” as the PokerStars Ambassador had been asking about this shirt on the live stream.